Monica R. Miller, PhD is Associate Professor of Religion & Africana Studies and Director of the Women, Gender, and Sexuality Studies Program at Lehigh University. Miller holds research interests in religion/irreligion in youth cultures and popular culture, changing contours of identity and difference, new black religious movements, diasporic mobility in transatlantic context, and theory and method in the academic study of religion. 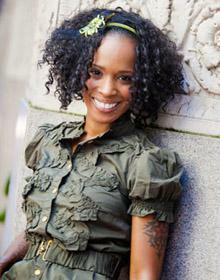 Miller is the author of numerous books and scholarly contributions spanning topics such as social difference in/and religion, transatlantic and diasporic blackness, religion in/and hip hop culture, and social techniques of identity (and, identification) in the study of religion. Miller is currently at work on two forthcoming books, New Black Godz: Towards a Theory of Black Religion as Identity, under contract with Bloomsbury Academic, a co-authored volume, Method as Identity in the Academic Study of Religion, under contract with Lexington Press, and a co-edited project with both Christopher Driscoll and Anthony B. Pinn on the production of black meaning in the work of hip hop artist, Kendrick Lamar, KENdrid Spirits: Kendrick Lamar and the Making of Black Meaning. Among a host of articles and book chapters, Miller is the author of Religion and Hip Hop, Religion in Hip Hop: Mapping the New Terrain in the US co-edited with Anthony B. Pinn and rapper Bernard "Bun B" Freeman, in addition to Claiming Identity in the Study of Religion, eds., The Hip Hop and Religion Reader also co-edited with Anthony B. Pinn, and most recently, Humanism in a Non-Humanist World eds. Miller serves among a host of national and international advisory and editorial board capacities spanning academic journals, presses and organizations such as The American Academy of Religion, The Journal of the American Academy of Religion, The Institute for Humanist Studies, The Marginalia Review of Books, The Journal of Hip Hop Studies, The Centre for Research in Race and Rights (UK), and most recently, The Louisville Institute Project Grant for Researchers Program (2018), among numerous others. Miller was awarded, and served as an international Fellow in residence at The Forschungsinstitut für Philosophie in Hannover, Germany during the 2016-2017 academic year.